Craig Middle School eighth-grader Greg Hixson (55) seeks a teammate to pass to under the basket during the Bulldogs' Thursday game against Baggs, Wyoming. The CMS eighth-grade A-team won, 24-17. Heading into the holidays hasn’t yet slowed down the members of Craig Middle School’s basketball teams. The Bulldogs swept the Rattlers, of Baggs, Wyoming, in three straight games Thursday night at CMS. The visiting squad from Little Snake River School fielded one team made up of students in multiple grades to play the seventh-grade A- and B-teams and the eighth-grade A-team. 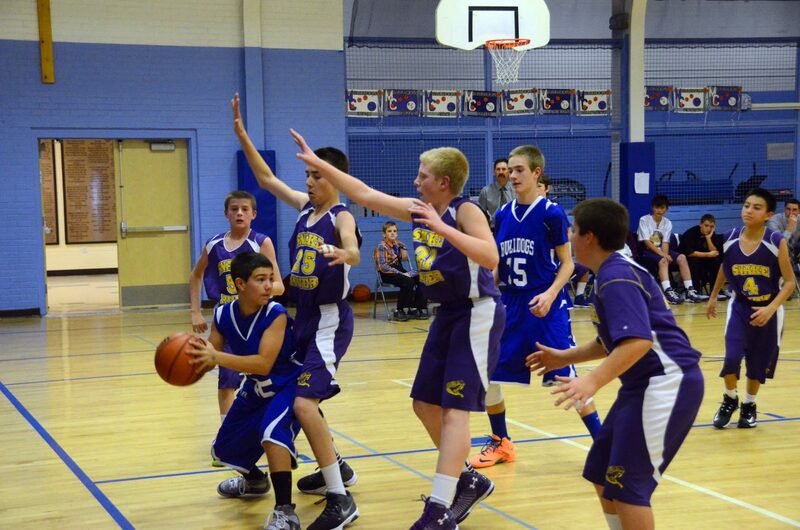 The seventh-grade B-team started the evening with a 16-3 win over Baggs, led by six points from Jeremiah Ziegler. A-team followed suit after two quarters that saw a tiny 8-7 lead, exploding in the second half, ultimately finishing 26-18. Caleb Cuevas led in scoring with eight points, but the effort was noticeable from everyone on the floor as the diamond press defense took form and everything else fell into place, coach Jason Buhrman said. “We rebounded well, cut down on turnovers, we took care of the ball, and the kids just went out, got after it and kept active,” he said. Both the seventh-grade teams are 5-6 this season. “The kids are really working hard, and they’re strong with the ball,” Buhrman said. Baggs couldn’t keep up with the eighth-graders as the night continued, the Bulldogs jumping out ahead 11-4 by the end of the first quarter. The scoring was about even on both sides for the rest of the game, ending the half 15-10 and the third quarter 20-16, but the early advantage was all CMS needed to close it, 24-17. Eighth-grade A-team is now 10-2, with the previous week’s games including a home loss to Rawlins, Wyoming, and a victory in Baggs. Both grades travel to Oak Creek to meet Soroco this weekend, the penultimate game before the season-ending tournament Craig will host in early December. “I’m hoping by the time tournament time comes, our whole game is going to be put together,” Folley said.